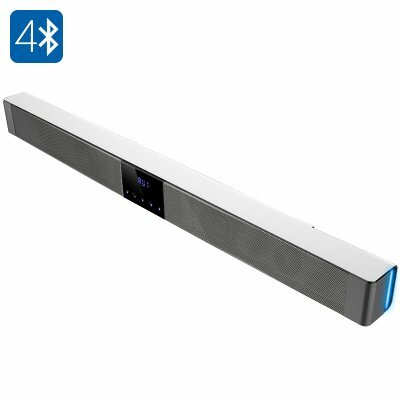 Successfully Added 39.37 Inch 70 Watt 2.1 Channel Sound Bar "Sound Wave" - Bluetooth 4.0, Bass, Optical, Micro SD Slot, Touch key, Remote to your Shopping Cart. 70 Watt sound bar will turn your living room into a true home cinema. At 1 meter long this brushed metal aluminum alloy sound bar is the best accessory for your home entertainment system. No longer do you need to take up excessive amounts of space with big floor speakers when this wall mounted wireless speaker can bring high quality sound to your living room and take up hardly any space at all. This sound bar combines some fantastic features and offers killer sound quality to instantly upgrade your living room into a home cinema at a fraction of the cost floor speakers. It’s quick and easy to install as you can lay it on a TV cabinet or mount it on a wall. The Bluetooth connectivity means you don't even need any wires to connect it to your media system and even lets you steam music from you Smartphone, tablet PC, TV box or other Bluetooth enabled device from up to 10 meters away. This metallic sound bar has AUX L/R in, SPDIF, line in and USB inputs letting you connect it to your games consol, TV, DVD player or alternatively just play music directly from the speaker with a memory pen or via the micro SD card slot, which supports up to 32GB cards. With a 70 Watt output this slim speaker can easily be mounted beneath you TV or upon a wall and add great audio to compliment your TV’s sound, you can connect it to a bass speaker and operate it remotely from the remote control. This 70 Watt sound bar comes with a 12 months warranty, brought to you by the leader in electronic devices as well as wholesale speakers..